The things we love irritate us the most (sort of). For me, it's The Walking Dead. It's a show full of zombies, in-fighting, zombies, good characters, fantastic acting, zombies, great action sequences, zombies, guns, and above all, zombies. If only the show didn't have kids. I'm going to get a little spoiler-y from here on out, so duck out if you don't want season two ruined for you. Seriously, someone's always telling Carl, "Go find your mother!" or "Get in the house," and his mother never knows where he is and HE NEVER STAYS IN THE HOUSE. 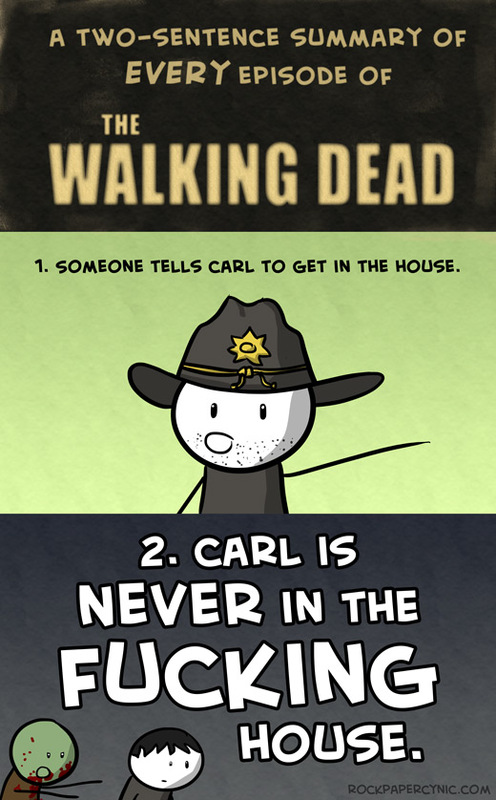 In last week's episode he screws up where he's supposed to be no less than three times, and in doing so releases a zombie from a mud pit (which results in someone getting killed) and later interferes with an execution (which results in two people getting killed, when he again, refuses to stay in the goddamn house.